An ectopic pregnancy is when an egg becomes fertilised and attaches outside of the womb. It happens in around one in 100 pregnancies. Unfortunately, an ectopic pregnancy can't survive and, because it can risk the mother's life, women who have an ectopic pregnancy often need treatment to end it. This can be a very difficult, stressful and upsetting time for the woman and her partner. It's common to have some mild period-like cramping and discomfort during the first trimester of pregnancy. But if you have significant pain or bleeding in early pregnancy, it's important that you contact your GP, midwife or LMC to find out what's causing it. These symptoms could be an ectopic pregnancy or a miscarriage. Other symptoms of an ectopic pregnancy are pain at the tip of your shoulder, unexplained diarrhoea, or fainting and dizziness. If you get sudden severe abdominal (tummy) pain or heavy bleeding in early pregnancy, contact your midwife or LMC immediately and go straight to the Emergency Department. A doctor will examine you and arrange for you to have an urgent ultrasound scan if they think you have an ectopic pregnancy. You may also have a blood test to look at the level of pregnancy hormone (hCG) in your blood. The ultrasound scan will usually help show where the pregnancy is – in your womb, or somewhere else. Most women just need one ultrasound scan to pick up an ectopic pregnancy, but some women need more scans. If your ectopic pregnancy bursts (ruptures) and causes bleeding into your tummy (abdomen) you'll need urgent surgery. You may also need surgery if the ectopic pregnancy is likely to rupture soon, or if the diagnosis is unclear and the ultrasound scan can’t rule out an ectopic pregnancy. Most surgery is done as keyhole surgery (laparoscopy), but some women need open surgery (laparotomy). Most ectopic pregnancies grow in one of the uterine (fallopian) tubes, as shown in the illustration. But they can also happen in other places. During surgery the pregnancy tissue is removed and if possible the fallopian tube is repaired. This surgery is called a salpingotomy. Often, it's not possible to repair the tube, in which case the whole fallopian tube is removed. This surgery is called a salpingectomy. Many ectopic pregnancies will end on their own without needing any treatment, so some women are offered an option of watching and waiting. have no foetal heart beat on their ultrasound scan. If you're treated this way, the gynaecology team will monitor you to make sure the pregnancy is ending on its own as expected. You'll need to have regular blood tests to check that your hCG levels keep falling. have no medical problems that mean they can't take methotrexate. Before being offered this treatment you're likely to have blood tests and repeated ultrasound scans over several days. If doctors recommend this treatment for you, they'll give you more detailed information before the treatment starts. It's a good idea to see your GP two to three weeks after having an ectopic pregnancy, for a general check-up and to see how things are going. Women who've had an ectopic pregnancy often feel that others dismiss their feelings of grief at the loss of their baby. Urgent treatment can feel very clinical, and it's easy for medical teams to forget to talk to women and couples about how they're feeling. It's important to acknowledge and allow yourself to have these emotions. Make sure you see either your GP or a counsellor early if you're finding it hard to cope after the loss of your baby. About ectopic pregnancy, including what to expect afterwards. More information about why ectopic pregnancies happen, how they're diagnosed, and why they have to be ended. 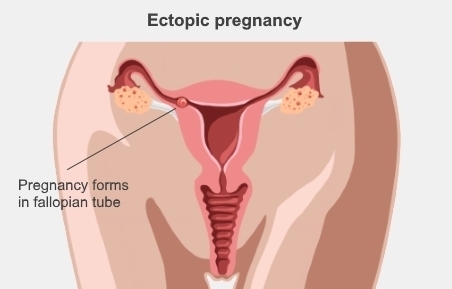 What is an ectopic pregnancy? Who does it happen to? What are the treatment options? This British site has information for couples who've had a ectopic pregnancy, as well as online support forums.